The value of pipe #490 is n/a points. Carl Skaggs offered a pipe rack with eight pipes on eBay. There were this one, an Oyster White Billiard and an Ebony Dublin in the lot. I won the bidding and found that the painted pipes were in much worse condition than I had hoped and of no help to the collection, so the Dublin will go to Pipes for Sale and the Billiard will join the Pipes for Trade. This pipe was in pretty good shape and a worthwhile addition to the collection of MADE IN ENGLAND pipes. The liner has been smoked pretty heavily but is caked only around inside of the rim of the liner (the MADE IN ENGLAND liners have a beveled edge and this pipe's is caked.) 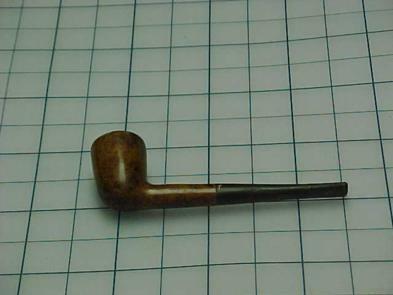 The mouthpiece show some tooth abrasion and mild oxidation and the briar has three noticeable fills. It is, however, a fairly good example of a very rare shape/color. When an un-smoked example came to me, this one moved to the Pipes for Sale page. Rick Osborn decided it would supplement his collection nicely and bought it.